Nachdem am letzten Wochenende laut UNHCR 7.000 Flüchtlinge von Mazedonien aus nach Serbien einreisten verwundet es kaum, dass gestern ein neuer Höchststand der Aufgriffe an der serbisch/ungarischen Grenze erreicht wurde. Laut der ungarischen Polizei wurden innerhalb der letzten 24 Stunden 2.093 Personen gezählt, womit erstmals die 2.000er-Marke überschritten wurde. The government plans to put forward new legislation to provide a “legal seal” for Hungary’s border, after the physical fence recently erected, the justice state secretary said. The criminal code wll be tightened on regulations against human smuggling, but procedures for handling migrants will also be made faster and more efficient, Róbert Répássy told public news channel M1. He said the sanctions must have a preventive effect so that human smugglers and illegal entrants are given the message that their activities are unwelcome.He noted that although there is always chance for asylum-seekers to appeal their case, these court procedures can be expedited. The Hungarian government is building a fence on the border with Serbia to keep out the ever-increasing flow of refugees to Europe. But just look at a map. 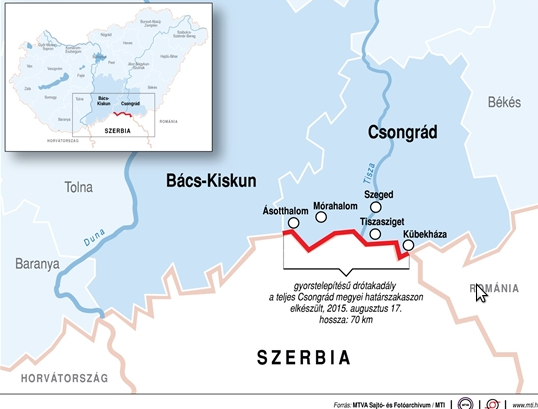 Serbia represents a tiny slice of Hungary’s meandering southern border. If desperate asylum-seekers have traveled thousands of miles to get to Europe, a fence that runs for a little more than 100 miles won’t stop them. 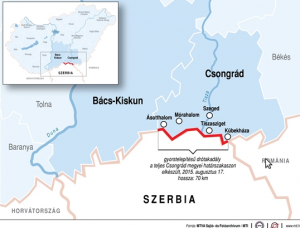 Why is Hungary building a small fence on a long border? The fence will divert migrants toward Croatia or Romania on their way to final destinations in the wealthier parts of Europe. And that is precisely the point. Croatia and Romania are EU member states. Serbia is not. Under the “Dublin Regulation,” the legal framework for processing asylum claims in the EU, the member state where asylum-seekers first enter the EU bears responsibility for them until their claims are processed. If Hungary diverts migrants so that they enter the EU first through other member states, then Hungary evades Dublin obligations. 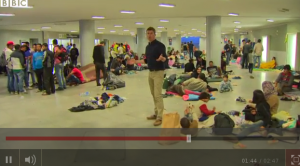 After 9 pm on Saturday night a train to Munich was stuck at the station for several hours – why? 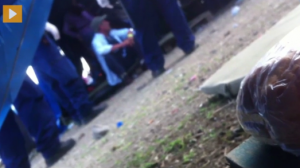 Because 200 Afghan people had been removed from the train, but refused to leave the platform and sat down to the ground. The police isolated the platform and were negotiating with the group for hours, letting the train leave four hours late from its schedule. The group was then taken inside for an official check, ensuring that all of them would be fingerprinted in Hungary. Die EU gibt Ungarn grünes Licht für die Errichtung des Grenzzauns zu Serbien. Man sei zwar „aus Prinzip“ dagegen, habe jedoch keine Handhabe. Geld aber auch nicht. Menschenhandel und illegale Einwanderung werden in Ungarn jetzt rechtlich auf eine Stufe gestellt und stärker bestraft. Orbán lässt Kompanien von „Grenzjägern“ aufstellen, die dem Traum der Jobbik-Neonazis nach einer „Gendarmerie“ sehr nahe kommen. Die EVP übernimmt unterdessen Orbáns Anti-Asyl-Linie – vor allem auf Kosten der Türkei. Ein ungarischer Journalist hat sich als Flüchtling ausgegeben und so Zugang zu dem Lager Röszke an der serbisch/ungarischen Grenze bekommen. Hier der Artikel, der auch etliche Videos enthält. Die Zahl der Flüchtlinge aus Syrien, Afghanistan und Pakistan, die über die sogenannte Balkanroute nach Westeuropa gelangen wollen, steigt rasant an. Täglich kämen 2000 Migranten im griechisch-mazedonischen Grenzgebiet an, doppelt so viele wie noch vor einer Woche, berichten private Hilfsorganisationen.